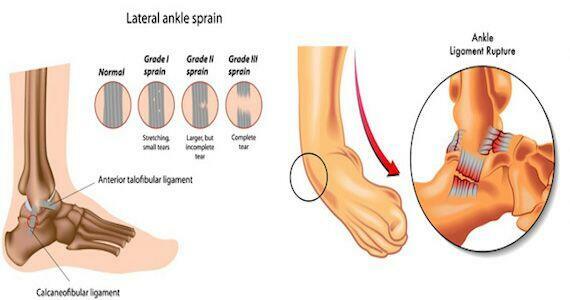 An ankle sprain is LIGAMENT damage! Ankle injuries are a significant cause of time away from sport and regular activities – yet they are often misdiagnosed and not treated appropriately, leading to ongoing pain and instability. In the ankle, inversion (rolling in) injuries are approximately 4x as common as eversion (rolling out) injuries, due to the joint structure and relative weakness of the outer ligaments (ATFL, CFL) compared to the inner ligaments (deltoid). The aim of initial clinical management of an ankle sprain is to rule out a fracture and identify the specific ligaments affected, and to what extent. Sometimes a weight-bearing X-ray and an MRI will be required to aid diagnosis and streamline rehabilitation in more severe cases. Many people are unsure when to start treatment and are often given poor advice to “let it sort itself out” when they have an X-ray that comes back without demonstrating a fracture. Remember that an ankle sprain is ligament damage. It is extremely important to commence physiotherapy as soon as possible (within 24-48 hours) after an ankle sprain in order to accurately assess the injury and begin treatment. Early intervention will lead to better long term outcomes and a quicker return to sport in most cases.